9:00 a.m. to 6:00 p.m. everyday with the last guided tour at 6:00 p.m. Unaccompanied visits are not permitted in the house. There are guided tours provided throughout the day in Thai, English, French Chinese and Japanese. Adult 200 Baht Visitors under 22 years 100 baht (ID required) Children under 10 years of age, when accompanied by a parent, entrance is free. 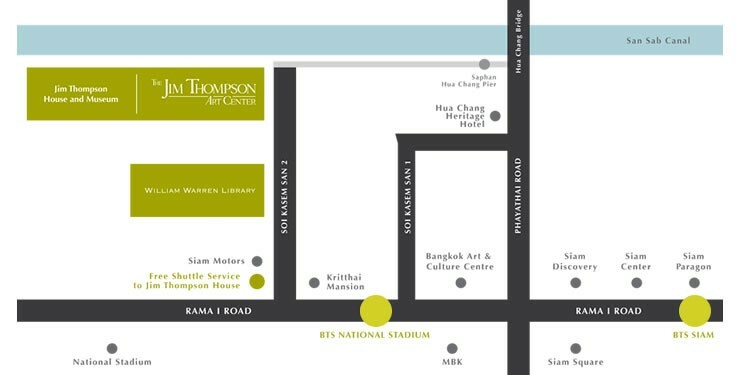 Located in the center of Bangkok, Jim Thompson House Museum is conveniently reached by car, taxi, Tuk tuk, and the BTS Sky Train (Exit Nº1).